Year 27 BC wis aither a common year startin on Sunday, Monanday or Tysday or a leap year startin on Monanday (link will display the full calendar) o the Julian calendar (the sources differ, see leap year error for maire information) an a common year startin on Sunday o the Proleptic Julian calendar. At the time, it wis kent as the Year o the Second Consulship o Octavian an Agrippa (or, less frequently, year 727 Ab urbe condita). The denomination 27 BC for this year haes ben uised since the early medieval period, when the Anno Domini calendar era became the prevalent method in Europe for naming years. Gaius Julius Caesar Octavian becomes Roman Consul for the seivent time. His pairtner Marcus Vipsanius Agrippa becomes Consul for the third time. January 16 – Octavian formally returns full pouer tae the Senate; they gie him the titles o Princeps an Augustus. He accepts this honor, haein declined the alternative title o Romulus, thus becoming first Roman emperor. Caesar Augustus starts a new military reform. He reduces the nummer o legions tae 26 an maks the Praetorian Guard (1,000 men). Augustus forms the Classis Misenensis, based in the herbour o Portus Julius at Misenum. Agrippa divides Hispania Ulterior intae Baetica an Lusitania, an enlairges Hispania Citerior. Northern statue o the Colossi o Memnon is shattered bi an earthquake in Egypt (accordin tae Strabo). Marcus Agrippa begins the construction o the auld Pantheon, Rome. 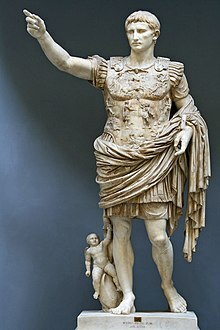 Augustus' first census o the Roman Empire (fermerly the Roman Republic) reported a total o 4,063,000 citizens. ↑ Gross, W. H. "The Propaganda of an Unpopular Ideology", in The Age of Augustus: Interdisciplinary Conference held at Brown University, April 30–May 2, 1982, edited by Rolf Winkes (Rhode Island: Centre for Old World Archaeology and Art, 1985), 35. This page wis last eeditit on 24 Mey 2018, at 16:44.